The modern, contemporary Odinist strives continually for advancement in a fighting spirit that resides in his or her proactive essence. Proactivity is healthy orlog, individually and collectively, that will help lead to a righteous wyrd. Examples of proactivity abound in our lore and in the Sagas, from the indomitable spirit of our ancestors up to the settler-folk and pioneers in recent history. With the advent of industrialization and materialization, however, the runic force of Nauthiz was removed from the ideology of modern European culture. Convenience, commercialism and consumerism replaced effort, originality, frugality and ingenuity. European man had become “modern” in the context of egalitarianism and liberal decadence. In the Odinic Rite, when we say, “Odinism in the Modern World,” it is not in this context but in the context of the new post-modern age, and as contemporary. Our faith is an ever evolving faith, with one foot in the past, always, and another in the future in proactive fashion. This is a rejection of the alleged “progress” in the century which ushered in a cultural paradigm shift in the work ethic and psychology in the West, from largely proactive to reactive. Thought became subordinated largely to emotion, and more emphasis was placed on environment, conditions and external factors in determining a person or group’s state of being. With the development of the social sciences and the mass media came the conformity of attributing environmental factors as a cause, instead of hereditary and personal merit, or lack of. In this psychology came a reactionary mind-set into the popular culture whereby the individual took the place of family, tribe, race, folk and even nation. Hyper-individualism, in conjunction with materialism and technology, shunned originality, creativity and the ability to respond (i.e. responsibility). The reactive mind-set is largely atheist (materialist) and Christian oriented. Atheism rejects faith and the positive energies it generates; Christianity absolves itself from responsibility spiritually by rejecting Nature and embracing a dualistic religiosity that mandates superficial “salvation.” Atheism, likewise, yet on the other end of the spectrum, is dualistic, yet in the opposite direction. To affect positive and noble orlog, one must harness one’s noble potential faithfully, which in Odinic theological terms is referred to as maegen or main. “Religious endeavour is focused, therefore, on establishing and maintaining this special relationship with the gods in order to enable man, not just to cope better with life, but to realise a potential which would otherwise remain beyond his grasp.”  Potentiality exists in the runic force of Ingwaz, the rune of gestation and fertility. “In the NG-rune is contained the mystery of the transformational process of withdrawal-transformation-return.”  Potentiality, not Jesus Christ, money or hard science, brings salvation and strength. Spiritual transformation is the theme of contemporary Odinism, becoming more and more noble and advanced with the help of the God forces within us and beyond. The difference between the Odinic concept of wyrd and the Hindu concept of karma is the revolutionary, proactive, transformative force of orlog, the noble combination of free will, natural law and the supernatural. In our lore, proactivity exists in the song of Balder’s Dreams whereby Frigga attempts to save Balder by proactively dispelling harm through subordination of the environment and conditions to the values of honouring Balder. Yet her dismissal of the smallest potential, the mistletoe which eventually brought Balder’s death, was overlooked and the result was bad orlog. Thor’s campaigns into Jotunheim to fight the Etins illustrates proactivity in an offensive manner of initiation. From taking the initiative only can potential be realized; from idealism to realism. Mjolnir, Thor’s hammer is the holy symbol of proactivity, a martial icon of fertility and construction as well as destruction, a pendulum of proactive might and main. By Thor we can accomplish anything, Thor supplements our natural might in an interdependent manner; supplementation instead of substitution. Proactivity is not only a mind-set and an attitude, but a consciousness and conscientiousness of one’s orlog. The word orlog, meaning previous or primary layers, pre-law, original layers of activity is a prelude to proactivity. Can anyone be proactive and aware of his or her orlog? I do not believe so and the reason being is that genes and intelligence do not allow for such psycho-spiritual activity and consciousness in some individuals or races. I believe the Odinist is only truly capable enough physically, mentally, and socially to harness such a consciousness. 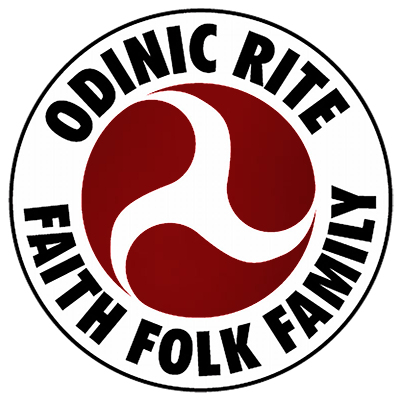 The positioning of the Odinist in relation to mainstream religion, culture and science allows for a proper independence that most cannot achieve due to being constrained by religious, scientific or pop-cultural dogma. Due to our theology being polytheistic (i.e. heathen/pagan) I would actually characterize our position as more interdependent than independent as the web of wyrd recognizes that all things are connected. Mainstream religion, science and popular culture reside within dependent positions; atheism in contrast is improperly independent. Odinic interdependence takes into account natural law, time, consciousness and willpower, with proactive judgement and discernment guiding the process. Is it not absurd how the word karma has become adopted into many European languages, yet in India this religious concept has failed to deliver the masses from abject poverty? Would the masses of our European peoples as non-Odinist be able to adopt the concept of orlog in the same manner yet with more beneficial results? I believe so, but only partially due to their lack of faith and troth in our Gods. The consciousness of orlog has a causal connection not just with our physical brains and heart but with our folk-soul. To harvest one’s full orlog one must be theistic and truly believe in and honour our Gods, not just recognize them as archetypes, higher ideals or mental and cultural constructs on an exoteric objective level. I have met more than enough Odinists who are simply atheists in Nordic window dressing. Tapping into our folkish, heathen Divinity in an interdependent manner with our Gods is the only way to create a noble destiny. This is illustrated all too simply by Odin’s example of winning the runes through his wode, or in Thor’s battle frenzy and the many geniuses of our folk who were driven by a force they often could not name. Living a proactive lifestyle is not just a matter of looking at past actions, learning from past mistakes or simple determinism. The free will aspect of orlog is rooted in the Odinic triune (Odin-Vili-Ve), imparted in us, yet beyond us, and connected to the Norns. Being proactive is a manner of listening to the blood, to the Odinic triune and their gifts to us, as described in the Edda and our ancestors and successors. Criticism or Endorsement of the OR Way? The Ancient White Horse Stone Under Attack Again! !